Find a vacation home to rent in Lika-Senj from our list of vacation rental properties. Campaya has over 400 vacation homes available in Lika-Senj, which give you the possibility to locate a unique accommodation in Lika-Senj which completes your check-list in search for the perfect self catering vacation apartments in Lika-Senj or vacation villas in Lika-Senj. On the first floor of the family house are located these two simply furnished holiday apartments with terrace. 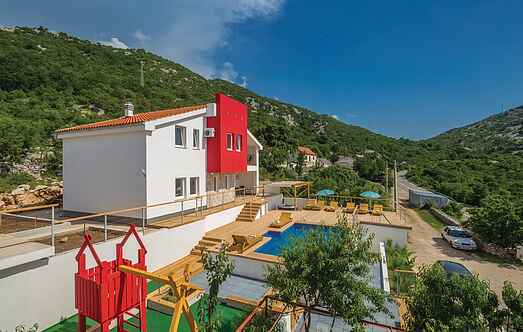 Relax in this magnificent holiday house with pool, which is located in a small village, of the Kvarner region and near the town of Senj. Right next to the sea, in a small hidden place Josinovac, these simply and functionally furnished holiday apartments are located, each with an enchanting panoramic view of the blue sea. This holiday house is located in the centre of Senj. The ground floor is not available, while on the upper floor are three bedrooms, kitchen and living room. This cozy holiday home is located direct on the sea, in a quiet and piece full place away from crowd and city noise. Spend a beautiful vacation in this tastefully furnished holiday home away from the city turmoil. This accommodation is a perfect choice, if you want to leave the everyday routine and the stress behind. Relax yourself in this small coastal village named Sveti Juraj. For those who want to spend a holiday away from the city noise, this is an ideal place. Spend a relaxing vacation, almost directly on the water in this cozy holiday home, which is located in the bay Spasovac. It is situated close to the pebble beach, in a natural environment. For a peaceful and relaxing holiday, this is the ideal holiday home. It is located directly on the sea in the small town Sv. Juraj. This nice holiday apartment is located in a family house in good location of the city Senj. Enjoy the beautiful view of the sea and the landscape. These holiday apartments are located in a family house in Lukovo Šugarje, a small village at the foot of the mountains of Velebit. Centrally located in the town of Senj, in Trbusnjak district, are these tastefully furnished holiday apartments situated in an apartment building.